Basic Skin Care Routine | The Best Anti-Aging Products Produce Great Results! Integrating these three anti-aging treatments into a daily rejuvenating skin regime will have the greatest impact in effectively optimizing the results for the basic skin care routine in a simple, straightforward manner. Remember that there isn't just one product that can cure all aging skin symptoms, (just as there isn't one medicine that can treat all medical problems), so it is important to experiment a bit to find the combination of the best anti-aging skin care treatments that work best for your particular skin type and aging symptoms. Cleanse: Gentle Cleansing for all skin types, Aveeno Active Naturals Positively Ageless Cleanser is an excellent soy based anti-aging moisturizing facial cleanser. Consider substituting the evening AHA exfoliation with a microdermabrasion exfoliating scrub such as IQ Naturals Microdermasion once or twice a week and a weekly skin peel. If you feel like a bit of extra pampering or just want a little fun with some swirling action try one of the home microdermabrasion spa kits, like a Home MicroDermabrasion System which utilizes the same aluminum-oxide crystals that the professional spa treatments use. The general rule of thumb is that only five home microdermabrasion treatments are the equivalent to one professional dermabrasion. Once you have established a basic facial rejuvenation regimen, then start to slowly integrate the layering technique to expand your basic skin care routine into a more comprehensive strategy. 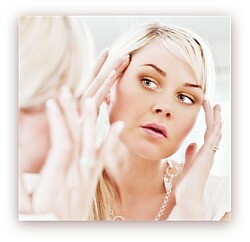 Your facial rejuvenation shopping list. . . 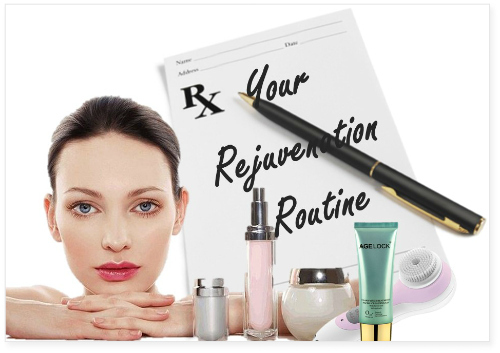 If you need more help choosing the most effective anti-aging products so you can begin developing your own skin rejuvenation routine then the shopping lists are tailor made for you.